The best figures in terms of exhibitors and visitors since 2008 for a BIEMH full of new products. The domestic market situation with an increase in consumption of 36% permits foretelling a magnificent fair this year. The 29th BIEMH has been presented this morning at BEC, in an optimistic atmosphere after several very complicated years. 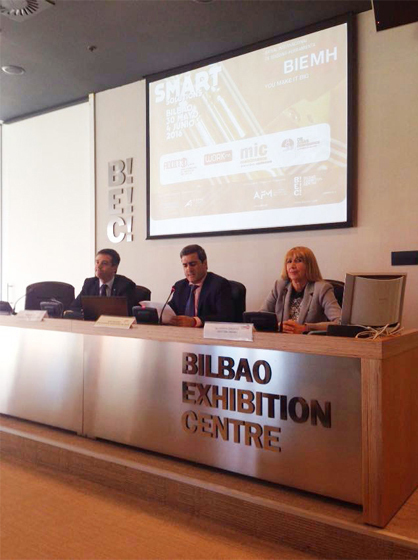 Xabier Basañez, Director General of Bilbao Exhibition Centre, Mª Carmen Gorostiza, Director of the 29BIEMH and Xabier Ortueta Director General of AFM and of ADDIMAT, have participated in the presentation. From the 30th of May to the 4th of June, the premises of the BEC will play host to 1,500 companies and a total of 2,149 products registered to date, more than 1,000 of which are machines, which will occupy pavilions 1, 2, 3, 4B, 5 and 6. Despite the situation of enormous uncertainty that we are currently immersed in, the sector’s figures in 2015 were positive, and the start of the year, although somewhat more timid, has not been bad: production has risen by 7.8%, consumption by 36%, import by 26%, and export, very slightly, by 1.9%. Based on these figures, we believe that the fair will confirm the good domestic market situation and that it will attract countless purchasers whose aim is to invest in improving their equipment. The fair has also incorporated many different changes, noteworthy among which are the ADDIT3D fair, which will be located in pavilion 3, and will be dedicated to additive manufacturing and 3D printing, and its industrial applications; and the WORKinn forum, to connect industrial companies’ personnel needs with young technicians who have just finished their studies and are going to join the labour market. The AFM association has incorporated into its management, ADDIMAT, created in 2014 and whose aim is to group together and provide a service for additive manufacturing companies, and more recently ESKUIN, the hardware and industrial supply cluster. Between the three associations, they group more than 240 companies, 96 of which will be present at the fair, occupying a very important part of the exhibition space of BIEMH.